The LSRWA Citizen Science Program offers outdoor opportunities for students and volunteers of all ages to get involved in monitoring and documenting environmental and biological conditions in our watershed. With a focus on land use and water quality, the LSRWA science team developed a Watershed Rapid Assessment Survey (WRAS) to “take the pulse” of our watershed. 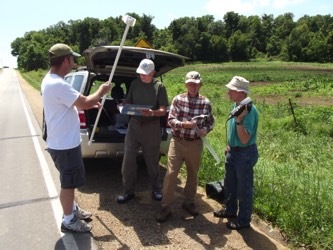 In 2011 and 2012, we trained over 100 volunteers to complete the field surveys twice at over 450 publicly accessible stream crossings in the 300-square mile Lower Sugar River Watershed. This effort helped volunteers “get to know their watershed”, while developing an understanding of conditions of a healthy watershed, such as protective vegetative buffers along streams in rural and municipal settings and characteristics of healthy stream habitats that include adequate cover and water clarity. The resulting color-coded maps depicting “high”, “medium”, and “low” watershed health conditions are used to raise citizen awareness and have helped to start a meaningful conversation with land owners, resource managers, and other stakeholders in the watershed about resource concerns and stewardship opportunities. We have further expanded our water quality data collection efforts by collaborating with watershed partners Decatur Lake Mill Race Association and the Lake Winnetka Sugar River Association to participate in the Wisconsin Department of Natural Resources and UW-Extension Water Action Volunteer (WAV) program. Through a grant in 2012 (to read the grant application, click here), we purchased four sets of sampling equipment for use throughout the watershed. We have since trained dozens of local students and volunteers to measure and document a number of stream chemistry and habitat quality parameters. This information is available to the public from our website (see Links below) and from WAV. It provides a measure of ecosystem health throughout the watershed. The WAV data collection reports are a compilation of statewide, county by county data covering a 20 year period. To learn more about Citizen Based Monitoring (CBM), visit the UW-Extension website. In 2014, WAV was funded through the Wisconsin Environmental Education Board to develop signs to mark 19 long-term WAV stream monitoring sites along with a supporting mobile-friendly website. Together the signs and website educate passers-by about watersheds, volunteer stream monitoring, and non-point sources of pollution. The sites are separated into seven tours, allowing visitors to compare land use and water quality between sites. A one-day annual Bioblitz event sponsored by LSRWA, where participants can spend time in the field with experts to learn about and help to document terrestrial plants and animals. The “Sugar River Corps of Recovery”, a river paddle and data collection effort encompassing the entire navigable Sugar River, initiated by LSRWA volunteers in 2015 to collect and assess biological data systematically along its length. The Wisconsin Frog and Toad Survey, part of a national volunteer-based program known as the North American Amphibian Monitoring Program, coordinated in our state by the Department of Natural Resources and its partners. Participants will join teams assembled by LSRWA to conduct a monthly one-night survey effort through the spring and early summer months to identify and document the audible calls of those species that occupy the Sugar River corridor. The Wisconsin Breeding Bird Atlas II, sponsored by the Wisconsin Society for Ornithology, WDNR and other partners. Participants of all skill levels are welcomed to participate in this 5-year survey effort. Contact us to learn more about these and other Citizen Science volunteer opportunities!